Artist Statement: My work deals with architecture as space humans enclose. The architecture becomes dynamic via its passage through time. A sense of time is clearly understood at historic sites and is also seen in the process of renovation. Most of all, passage of time is recorded in the marks left by functional changes made in structures over many years by human design or the elements and in changing patterns of light and shadow as the sun makes its daily journey across the sky. The process of building a collagraph plate layer by layer and the marks that result in the printing process have been evocative in expressing these subjects. About:When viewers ask how I make my prints, a friend tells them,” It’s magic.” Indeed, there is a magical quality to the process by which a drawing is transformed by the printmaking process into a new entity and the same image emerges from a plate each time it is inked. Printmaking imposes limitations which govern the choice of subject and encourage using the language of the medium to seek the essence of the subject. The daughter of a civil engineer, my fascination with the geometry of the urban space is my initial impetus in choosing subjects. The philosopher, Gaston Bachelard, said that buildings reverberate through time. Architecture, created by humans, is caught in the human cycle of birth, decay, and regeneration. Some buildings, like the Old State House in Boston, become stages for momentous events. Later generations seek to experience these sites of cultural seachanges. Other buildings shelter ordinary family or business activities and slowly adapt to social change and the natural aging process. In urban centers, such buildings often grow out of the debris of earlier cultures or stand next to buildings preserved from an earlier time. When the bulldozer breaks the ground of a city lot, it opens it to the future while excavating the past. 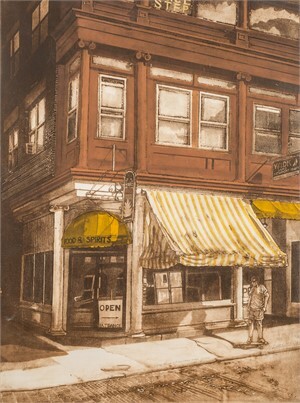 Grace, a full time printmaker since 1972, now lives in Narragansett, Rhode Island where she maintains a studio called Sassafras Press. She holds BFA and MFA degrees from the State University of New York at Alfred University. 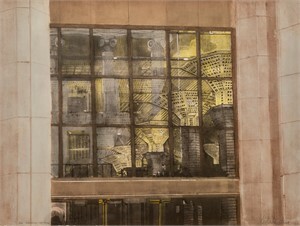 Her work has been exhibited in the United States, Poland, Germany, Austria, Czech Republic, Ireland and Australia and has been included in many private and public collections including The Portland Art Museum, Oregon, the Knoxville Museum of Art, Tennessee, and the Newport Art Museum, Rhode Island. She is a member of The Society of American Graphic Artists, Boston Printmakers, Los Angeles Printmaking Society, The American Color Print Society, the Printmakers Network of Southern Rhode Island, The Art League of Rhode Island, and 19 on Paper. 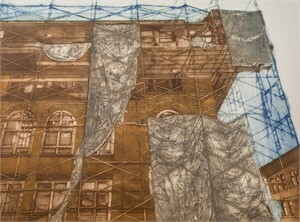 Process:Collagraphs are limited edition prints made from plates that are collages of paper, fabric, or other materials built up from a substrate. Grace makes a drawing on tracing paper and uses it to transfer shapes to thin, white paper. Paper shapes, adhered in layers, result in a low bas relief. Next, She adheres silk organza to the plate and paint areas of the plate with acrylic gloss medium to achieve a range of values. 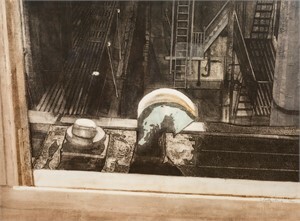 This technique is called silk aquatint because the weave of the organza holds and prints tiny specks of ink. The result looks much like traditional aquatint. Finally, Grace create textures using such materials as found objects or modeling paste. When the plate is complete, it is also sealed with acrylic, and she can intaglio ink it as one would a metal plate. Having more levels than a metal plate, I can add additional ink colors by rolling ink on the surface. Combining inks in this way provides many options for color effects achieved by choice of colors and the relative viscosities of the over and under colors. 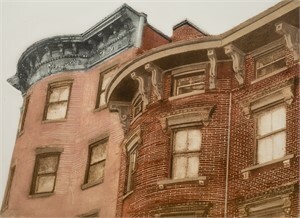 Printing a second plate over the first offers other possibilities. After many colors are applied, Grace covers the plate with dampened all-rag paper and special blankets that help force the paper into all the crevices and textures of the plate as it passes through the printing press. The press transfers ink to paper and also creates an embossment that remains after the ink is dried. Artist Statement: My work deals with architecture as space humans enclose. The architecture becomes dynamic via its passage through time. A sense of time is clearly understood at historic sites and is also seen in the process of renovation. Most of all, passage of time is recorded in the marks left by functional changes made in structures over many years by human design or the elements and in changing patterns of light and shadow as the sun makes its daily journey across the sky. The process of building a collagraph plate layer by layer and the marks that result in the printing process have been evocative in expressing these subjects. About:When viewers ask how I make my prints, a friend tells them,” It’s magic.” Indeed, there is a magical quality to the process by which a drawing is transformed by the printmaking process into a new entity and the same image emerges from a plate each time it is inked. 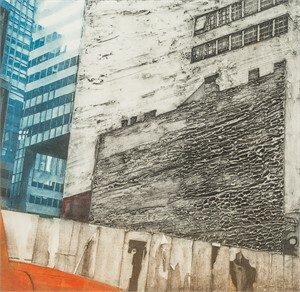 Printmaking imposes limitations which govern the choice of subject and encourage using the language of the medium to seek the essence of the subject. The daughter of a civil engineer, my fascination with the geometry of the urban space is my initial impetus in choosing subjects. The philosopher, Gaston Bachelard, said that buildings reverberate through time. Architecture, created by humans, is caught in the human cycle of birth, decay, and regeneration. Some buildings, like the Old State House in Boston, become stages for momentous events. Later generations seek to experience these sites of cultural seachanges. Other buildings shelter ordinary family or business activities and slowly adapt to social change and the natural aging process. In urban centers, such buildings often grow out of the debris of earlier cultures or stand next to buildings preserved from an earlier time. When the bulldozer breaks the ground of a city lot, it opens it to the future while excavating the past. 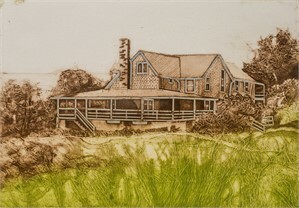 Grace, a full time printmaker since 1972, now lives in Narragansett, Rhode Island where she maintains a studio called Sassafras Press. She holds BFA and MFA degrees from the State University of New York at Alfred University. 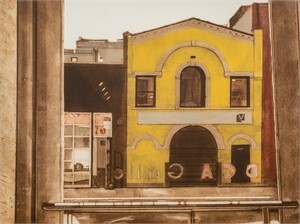 Her work has been exhibited in the United States, Poland, Germany, Austria, Czech Republic, Ireland and Australia and has been included in many private and public collections including The Portland Art Museum, Oregon, the Knoxville Museum of Art, Tennessee, and the Newport Art Museum, Rhode Island. 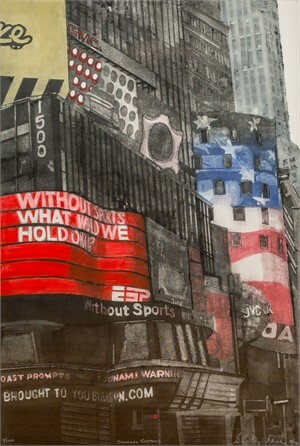 She is a member of The Society of American Graphic Artists, Boston Printmakers, Los Angeles Printmaking Society, The American Color Print Society, the Printmakers Network of Southern Rhode Island, The Art League of Rhode Island, and 19 on Paper. 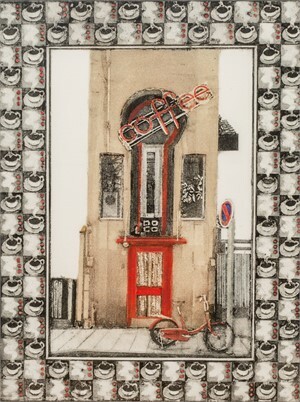 Process:Collagraphs are limited edition prints made from plates that are collages of paper, fabric, or other materials built up from a substrate. Grace makes a drawing on tracing paper and uses it to transfer shapes to thin, white paper. Paper shapes, adhered in layers, result in a low bas relief. Next, She adheres silk organza to the plate and paint areas of the plate with acrylic gloss medium to achieve a range of values. 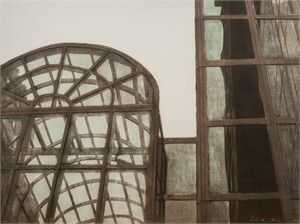 This technique is called silk aquatint because the weave of the organza holds and prints tiny specks of ink. 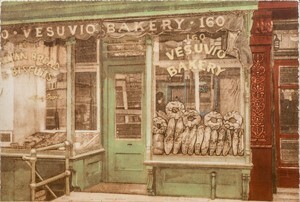 The result looks much like traditional aquatint. Finally, Grace create textures using such materials as found objects or modeling paste. When the plate is complete, it is also sealed with acrylic, and she can intaglio ink it as one would a metal plate. Having more levels than a metal plate, I can add additional ink colors by rolling ink on the surface. Combining inks in this way provides many options for color effects achieved by choice of colors and the relative viscosities of the over and under colors. 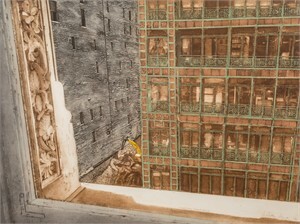 Printing a second plate over the first offers other possibilities. After many colors are applied, Grace covers the plate with dampened all-rag paper and special blankets that help force the paper into all the crevices and textures of the plate as it passes through the printing press. The press transfers ink to paper and also creates an embossment that remains after the ink is dried.